Last week, we predicted the Governor would nominate as Chief one of the "Magnificent Seven:" Schwarzenegger-appointed appellate justices with administrative experience, broadly defined to include service on the Judicial Council and other notable committees. 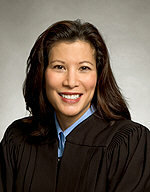 Featured prominently on our list: 3rd DCA Justice Tani Cantil-Sakauye. We noted she is a Schwarzenegger-appointee to the DCA who serves on the Judicial Council, is also president of her Inn of Court, serves as a Cal. Supreme Court special master, and was Governor Deukmejian's deputy legal affairs secretary. "'Justice Tani Cantil-Sakauye has a distinguished history of public service and understands that the role of a justice is not to create law, but to independently and fairly interpret and administer the law,' said Governor Schwarzenegger. 'She is a living example of the American Dream and when she is confirmed by the voters in November, Judge Cantil-Sakauye will become California’s first Filipina chief justice; adding to our High Court’s already rich diversity.'" Justice Cantil-Sakauye stated: "'It is a privilege and a tremendous honor to have the opportunity to serve as chief justice of the California Supreme Court,' said Cantil-Sakauye. 'I have had the distinct pleasure of being a municipal court judge, a superior court judge and an appellate court justice. Being nominated to serve on the highest court in California is a dream come true. I deeply respect the inspirational and visionary work of Chief Justice Ronald George and hope to build upon it. As a jurist, woman and a Filipina, I am extremely grateful for the trust Governor Schwarzenegger has placed in me. I hope to show young people what they can achieve if they follow their dreams and reach for their full potential.'" Maura Dolan at the LA Times reports: "'Cantil-Sakauye comes from humble roots. Her Filipina mother was a farmworker, and her Filipino Portuguese father, born in Hawaii, worked in sugar cane and pineapple plantations before moving to Sacramento. She is a Republican, is married to a Sacramento police lieutenant and has two children." Dolan continues, "[a] profile in Sacramento Lawyer said she was involved in issues affecting minorities during law school. She said her parents taught her that hard work would lead to a good future. During college, she waited tables and later said she earned more money as a waitress than she did in her first year as a lawyer. The profile said she could not immediately find work as a lawyer and worked as blackjack dealer in Reno. She said the Sacramento public defender would not hire her because she was too young. She took advice from an Asian American judge and applied at the district attorney's office. According to another biography, she is active in the Methodist Church, Girl Scouts and an Asian athletic foundation in Sacramento."